Notes: A somewhat wet week, but nonetheless a very productive one. Another three species were added to our cumulative site checklist - Black-crowned Night Heron and Northern Pintail in the back pond, and a Northern Mockingbird perching silently near the gate, and later just above the banding station itself. Meanwhile, we wrapped up the first month of the spring season with 77 species in total, knowing that many more will be arriving over the next few weeks. Already the first few Yellow-rumped Warblers have trickled in, accompanying the initial wave of White-throated Sparrows and male Ruby-crowned Kinglets. 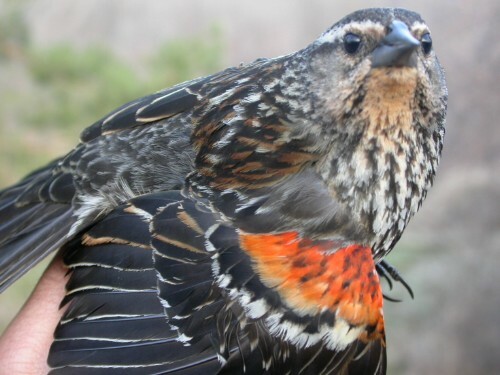 It was our busiest week of banding so far this spring, with nearly 100 birds of 18 species banded. 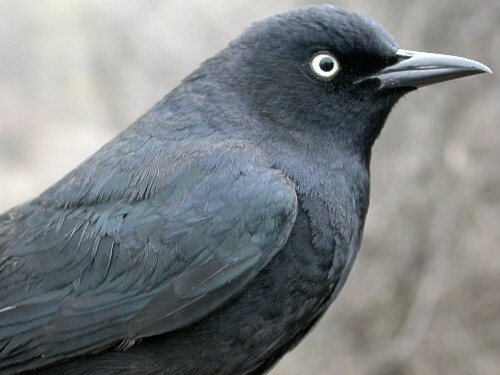 Among these were three new species for the site - Brown-headed Cowbird, European Starling, and Rusty Blackbird. The latter caused the greatest excitement, as there are relatively few banding stations far enough north to capture Rusty Blackbirds, and as they have been experiencing a rapid and to date unexplained population decline, any opportunity to study them is welcome. Meanwhile we also continued to band more of our most commonly encountered species, with American Goldfinches pulling into a first-place tie with American Robins at 153 each, as we come today to the end of our first year of operation. The Wood Frogs have already quieted down somewhat, but the Spring Peepers have remained very vocal on warm days, and we are seeing the Painted Turtles basking on the logs in the ponds more and more frequently. At least two Muskrats appear to be present, and the local White-tailed Deer are making regular appearances, although so far they have kindly stayed well away from the nets on banding days. No flowers in bloom yet, but the leaves on many shrubs and trees are growing visibly from day to day, most notably Manitoba Maples, Pin Cherries, Nannyberries, and Elderberries.